During my many years working for Alsco I was always passionate about environmental issues; recycling, cutting down on waste and reusing products where appropriate. This led me into early forays donating our surplus First Aid products and obsolete consumable products to worthy not-for-profit organisations – such as working with Rotary to send supplies to help hospitals in Nepal or to areas devastated by disasters like Samoa and Haiti. On my retirement I am keen to see the work with our contacts continued, and perhaps even expanded. So I was happy to put my hand up to take on this task on a voluntary basis – hence my new title ‘Ambassador – Charitable Donations’. I really like it! In addition to our existing contacts, I now have the desire to pursue other possible worthwhile avenues for donating expired, surplus and/or obsolete stock that is generated by Alsco. Our biggest association is with Medical Aid Abroad NZ (MAANZ) www.maa.org.nz, who tell us our “expired” first aid supplies are in great demand in those poorer nations who have no or little funds for medical supplies. Run totally by volunteers (the majority are former health professionals), MAANZ receives surplus drugs, equipment, and supplies to sort and store before sending overseas. 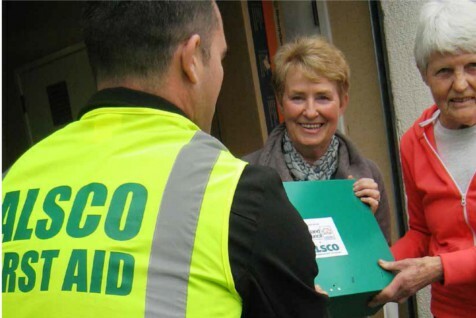 Via the relationaship with MAANZ, I am really proud that Alsco First Aid products have been able to help many worthy causes – the Pacific Islands of Fiji, Samoa, Papua New Guinea, Vanuatu, the Solomons, and more recently Korea. Christian and Missionary Alliance of NZ, short term missions to Tonga supporting locals and Mango Tree Respite Center providing care to handicapped children and their families. Various smaller organisations on an “as requested” basis. I am now back online at pmunro@alsco.co.nz and happy to consider any other worthy organisations. Just supply me a contact or lead and I will get in touch with them on behalf of Alsco. Some of the Alsco branches outside of my former Fresh & Clean home, notably Auckland and Dunedin, are already coming up with bright ideas and sending me surplus stock that is very much “usable”, such as sheets, pillow cases, blankets, and even some garments. These are really appreciated by MAANZ, who tell us of hospitals that don’t even have the basics like bed linen for their patients.